CAT is a Cone Tapered Aluminum Flagpole. *Larger sizes available. Please, contact us for information. Internal halyard type, aluminum revolving pulley assembly. Lead counterweight and stainless steel type, flag retainer ring. 1/8" dia. 7 x 19 construction stainless steel cable, flag halyard. Aluminum access door c/w keyed cam lock. Bronze snap hooks, swivel eye type, for flag attachment. Prices are HST extra where applicable - F.O.B. Toronto, Ontario. 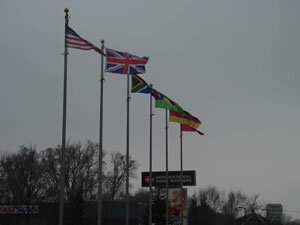 Please, call 1-888-513-8885 for pricing and information on our fiberglass series flagpoles.